The Young Turks do it once again! They demonstrate their lack of cross referencing and very simple fact checking leading to an embarrassing situation for an online media outlet that has an alleged intrest in journalistic intergrity and "giving viewers the facts". They commit a big mistake in their video title and description. They say in the title "Will Britain exit the Euro (Eurozone)". That is not the question being asked for British citizens at the referendum, the question being asked is should Britain leave the European Union not the single currency of which it it not a part of. For those of that don't know, the European Union is a political and economic union of 28 member states that have agreed on certain things like a common market, common regulation, relaxed border controls, free trade, agriculture policy etc. The Eurozone is a currency union (of which Britain is not a part of) of 17 European Union member states that have adopted the Euro as their common currency and sole legal tender. Monetary policy of the zone is the responsibility of the European Central Bank (ECB) which is governed by a president and a board of the heads of national central banks. In all seriousness, if they made this atrocious mistake at a professional media outlet they would be suspended and not even be considered serious by anybody. This is something a very simple google search would rectify. 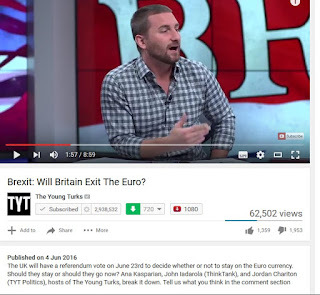 It is stuff like this that demonstrates why The Young Turks should not be taken seriously as a media outlet especially by younger generations who are their target audience because this can easily lead to misinformation, confusion and even ignorance of the politics of foreign nation. 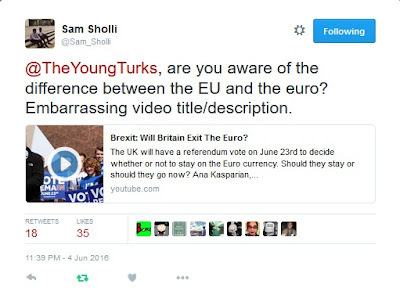 The irony of this is in their video they implicitly condemn ignorant Americans who don't care to know or care about European politics, yet in a way they are reflecting this carelessness and ignorance through their mistake which they still have not corrected a day after the video was released. This is not the first time something like this has happened, nor will it be the last. I don't think they're aware Sam. LOL. 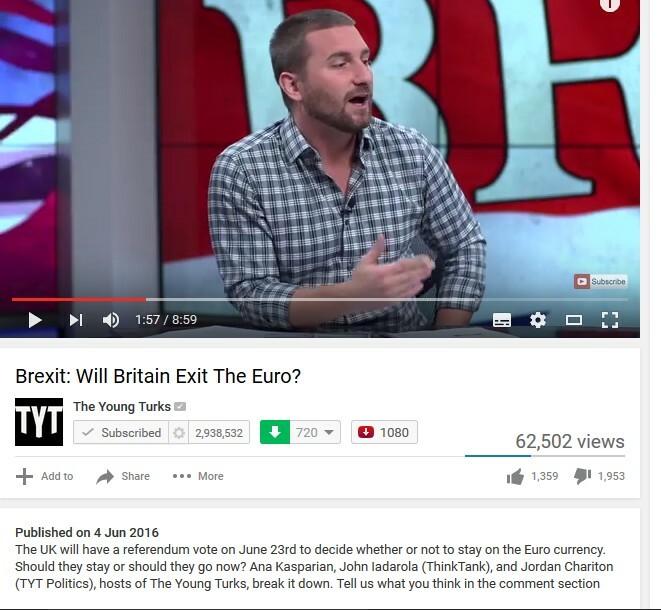 I don't think the TYT are even self-aware m8. It is official Info-Wars is a better source than TYT, Geez seriously.